Looking at this revolutionary product, I want to come back to the autumn 1999 and compare it with the anolog NVIDIA GeForce 256 videocard which still has SDR memory. Those, who were lucky to buy it, got disappointed a bit later, when there were going to appear similar videocards but with DDR memory which were much quicker especially in 32-bit color mode. And a year ago NVIDIA GeForce 256 cards with DDR started to sell. In spite of the fact that those card used the same graphics processor, a limited bandwidth of SDR were so obvious, that graphics subsystems on the base of DDR were much better in terms of performance. 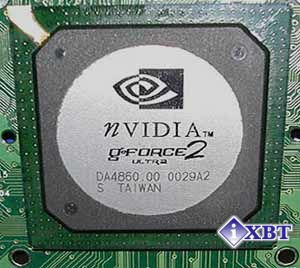 A release of GPU NVIDIA GeForce 256 was a sign of the fact that NVIDIA started to apply new technologies, i.e. HW T&L, DDR memory. This year a leader in performance among GPU is GeForce2 GTS series and its versions: GeForce2 GTS, GeForce2 Pro and GeForce2 Ultra. This revolutionary products yet have a bottleneck - DDR limited bandwidth. To make a new step, it's necessary to choose a right strategy. And it's better to change rendering architecture and this will be a way to weaken the requirements to the memory bandwidth. 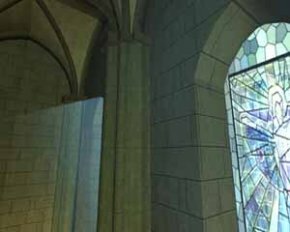 There are a lot of algorithms which allow to solve the problem of the bandwidth but still using a polygon rendering architecture. Besides, there is another way to solve the problem: multiprocessor graphics solutions, i.e. 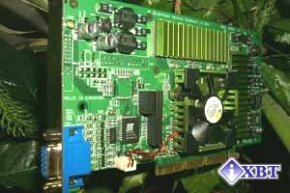 Voodoo5 5500 or Voodoo5 6000 from 3dfx. However, in this case you might face many other problems. For example, it's quite difficult to provide a well co-ordinated work of 2 and more graphics processors. Besides, there will be difficulty in compatibility with OS and mainboards. 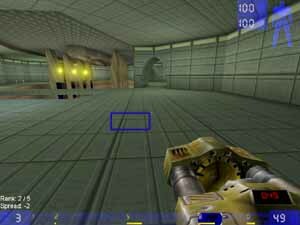 Do you remember Rage MAXX from ATI? It doesn't work under Windows 2000. Sometimes, NVIDIA is reproached with the fact that their new products don't differ much from their elder fellows. And that's true. For example, GeForce2 series; it was released a half year later after GeForce 256 had showed that partial renewal of the product is advantageous for nobody. So, it's much more profitable to release new revolutionary products rear. The example of GeForce2 and GeForce MX shows that NVIDIA offered newest graphics accelerators with HW T&L support in all sectors from Low-End to Hi-End, professional OpenGL solutions (Quadro, Quadro2, MXR), and soon it will start to occupy the market for mobile computers and integrated chipsets for mainboards (Crush series). In general, NVIDIA still remains a leader in the market. Mass sales of GeForce2 Ultra based cards prove it. When a competitor ATI Radeon started to beat GeForce2 GTS, NVIDIA has announced a first in the market - GeForce2 Ultra, which left Radeon behind. Later, when analyzing test results, we'll be able to talk about it in depth. Today we are going to consider Creative 3D Blaster Annihilator2 Ultra based on GPU GeForce2 Ultra, which belongs to High-End class and is intended for cool gamers. The price of the card corresponds to its class. Today most vendors don't develop their own PCB design, they just use ready-made designs from NVIDIA. Besides, NVIDIA delivers its graphics processors to vendors together with a memory. And you won't be able anymore to tell the difference between NVIDIA based cards from different manufacturers. External bus interface: full AGP 4x/2x (including Fast Writes, SBA, DME) and PCI 2.2 (including Bus mastering). Supports VIP 2.0 port of I level (8 bit, 75 MHz), it allows connecting external MPEG2 decoders/coders. GeForce 2 GTS chip has an integrated digital interface for TV coders. One of the major features of GeForce2 GTS/Pro/Ultra is 4 rendering pipelines, each with 2 texturing blocks. It allows to gain performance in games with multitexturing support. Besides, Ultra offers more fillrate value as compared with the previous GPU of GeForce series. If NVIDIA GeForce256 has it as 480 million pixels/s, NVIDIA GeForce2 GTS as 800 million, then, GeForce2 Ultra will give you 1 Gpixel/s. That's why it must work much faster. 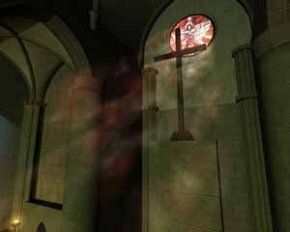 Moreover, it supports real trilinear filtering. Quality of anisotropic filtering is improved thanks to 16 textured samples. Well, let's consider some examples. Yes, anisotropic filtering has proved to be the best. But it can't replace a trilinear one. In theory, both filterings can be used simultaneously. Note that NVIDIA drivers are written in that way that in OpenGL only one filtering can be used, and in Direct3D there might be all 3 filterings at the same time, and their activation depends on an application. 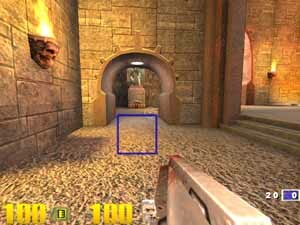 For example, in Unreal Tournament settings in Direct3D mode there is the following option: UseTrilinear = False/True. 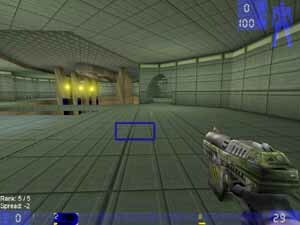 Unfortunately, Unreal Tournament doesn't "know" anisotropic filtering. A welcoming addition of this chipset is NVIDIA Shading Rasterizer (NSR). 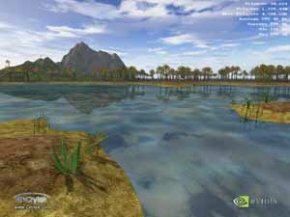 GPU GeForce2 can implement multitexturing, that is it can lay more than one texture on a pixel at a time step implementing texture blending operations. In principle, GeForce 256 can do it also, but GeForce2 has a wider set of these operations. To make possible multitexturing effects the control of texturing blocks will be realized via Pixel Shader API, which will be a part of DirectX 8.0. Below you can see the effects of per-pixel lightening and shading. Pixel Shader and NSR change the conception of multitexturing, that's why developers who want to use these technology have to develop a new module for its realization. 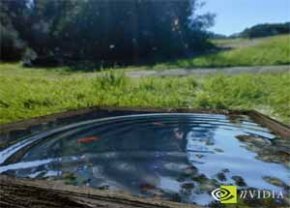 This method makes possible to reflect realistically all what you can see around, and first of all - water surface. 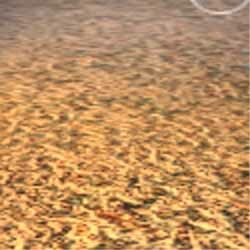 The screenshots shows the waves which are spreading off in real time mode when you touch the surface with a mouse cursor. Note that there are not only demo-versions of such games, but there already appeared new games of a new generation, i.e. 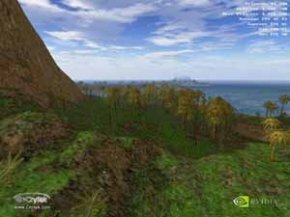 Real MYST, which use many modern effects, such as HW T&L and others. Now let's turn to the card itself based on GeForce2 Ultra. Note, that 3D Blaster Annihilator2 Ultra is a series card from Creative. The card has AGP x2/x4 interface, 64 Mb DDR SDRAM located in 8 chips on the right side of the PCB. The chips are located behind radiators, that's why we failed to define the manufacturer of the modules. In the Net we found out that they are from EliteMT 4ns. It means that the board has a very fast memory which can work at the regular frequency of 250 MHz (or resulting frequency of 500 MHz). Though the working frequency of this card was set to 230 MHz (460). NVIDIA GeForce2 GTS based videocards has 166 MHz (333) memory working frequency. And in this case the memory bandwidth is unnecessary for stable work of the graphics core. If we try to calculate the disbalance in figures (a ratio of graphics core and local videomemory frequency), we'll get: for GeForce2 GTS it equals 333/200 = 1.66. GeForce 256 DDR has the best ratio: 300/120 = 2.5. For GeForce2 Ultra we have 460/250 = 1.84. Yes, it's not very much. As we can judge, GeForce2 Ultra potential will be limited by memory bandwidth, despite the fact that there is no more faster memory. Interestingly, a cheaper GeForce2 Pro based card has it as 400/200=2. The sample we have is quite promising. We managed to get a stable work of the graphics core up to 300 MHz (at 305 MHz it wasn't so stable), the memory worked stable only up to 250 MHz (500 MHz). The card has a jack for a daughter card with a TV-out. 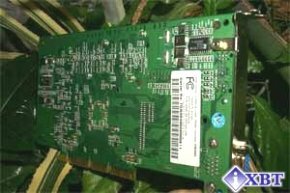 It allows to realize a universal connector for usage together with this card different daughter boards with TV-out, TV-in or TV-in/out. In result, changing the design, the manufacturers can produce various modifications, and moreover - even a multimedia combine. In the present case, the connector isn't used. Creative doesn't plan to use it, since GeForce2 Ultra based card is intended for gamers which use high resolutions and don't need a TV-Out. The graphics processor is hidden behind the radiator with an active cooler which has a bit strange form. The cooler's size is a little bigger, than we used to see. The chip heats not so strong as GeForce 256, but stronger than GeForce2 GTS. The drivers used at the testing were FastTrax based on the reference driver 6.34 from NVIDIA. These drivers can't be set on a "clear" OS with Standard VGA-adapter. Let's consider basic settings. Note that all options don't differ from that of reference drivers from NVIDIA. Note that S3TC technology is supported from the beginning. DXTC technology is used when the application supports it. The test was carried out with Vsync switched off. For a comparative analysis we tested GeForce2 GTS 64MB based videocard - Inno3D Tornado GeForce2 GTS/64 and ATI RADEON 64MB DDR (retail-variant). In principle, we expected this result. It doesn't make sense to increase the speed in 2D for a game card. As for 2D-graphics, in general the quality is very good. And what is the reason of such 2D quality? First, in this NVIDIA chip there is a completely new RAMDAC (not integrated in the graphics core). The second one concludes in the fact that TV-out moved from a main PCB to a daughter one. And now we're going to move toward the card's performance in 3D. The test was carried out in 2 modes: Fast (shows the card's work in 16-bit color ) and High Quality (shows the card's work in 32-bit color ). Well, the results are quite predictable, high speed increase as compared with the contestants. So it justifies the suffix "Ultra" and belonging to High-End class, since the card provides a good "gamability" even at 1600x1200x32. Note that memory overclocking doesn't practically influence the speed. At 800x600 in all modes FSAA provides a good game possibilities, that's why you have a choice between 1600x1200 and 800x600 with FSAA2x2. The gamability at 1024x768x16 in FSAA 2x2 is also good, but the mode of 1024x768x32 FSAA2x2 is of little use. Pay attention to a weak speed decrease when with anisotropic filtering in use. This game will help us to define the card's speed in Direct3D. 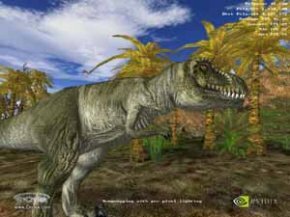 In 16-bit color the performance depends on the CPU frequency in all modes, and even the power of 1 GHz processor isn't enough for realization of GeForce2 Ultra. 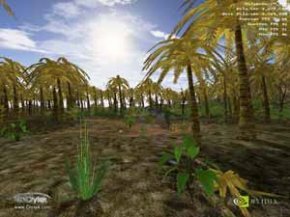 This test based on a new engine from Crytek shows us a usage of all latest developments of NVIDIA in 3D-graphics. It's not a synthetic test but a real game situation. There you can witness a real work of these cards with complex graphics. Lack for a bandwidth of 230 MHz DDR memory affects the speed in 32-bit color at the highest resolutions. The quality of 3D-graphics is marvelous! There are full trilinear filtering, anisotropic filtering, S3TC support; it makes possible to watch cool scenes with detailed objects. Though there is a problem of realization of the texture compression method in 32-bit color with S3TC work in autocompression mode. NVIDIA has some errors in the unpack algorithm; when at 32-bit graphics after unpacking we received 16-bit texels. Since we have a lot of DVDs available in the market today, many users are interested in new cards' work as for DVD-video support. I have mentioned already that NVIDIA GeForce256/GeForce2 chips support Motion Compensation when decoding MPEG2-stream. The most popular soft player that supports this chip fully is InterVideo WinDVD 2.1. I recommend to download DVD Genie utility for a complex setting of DVD-players, which supports NVIDIA GeForce256/GeForce2. 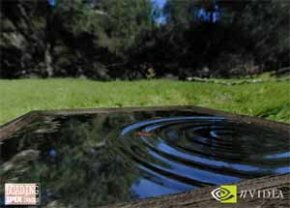 When we optimized all functions under NVIDIA GeForce2, the image on NVIDIA GeForce2 Ultra was just perfect. And the processor's load constituted only 20-23%! NVIDIA has released the most powerful accelerator. Creative Labs was first to create the card based on it. It's really of High-End level and intended for super gamers. Undoubtedly, the speed in 3D is unforgettable when playing modern games. You can easily get this card at $450. Though I think that the price will fall dawn probably to $300 to the coming January. Good drivers, support for all major functions (including FSAA). Difficulty in getting games which can use the whole power of GeForce2 Ultra.